Common sources of dirty electricity: solar panels connected to the main supply, energy saving CFL lamps, mains adaptors, chargers and power supplies, TVs and videos, computers, printers, washing machines, fridges, dishwashers, tumble driers, induction hobs, electric car charges and so on. Unlikely sources of dirty electricity: some incandescent bulbs, electrical fires and heaters, as well as immersion heaters, electric showers, older type electric ring cookers. Although dirty electricity is very common and can have ill health effects, the solution is very simple: plug in these highly recommended dirty electricity filters which filter out all that electro-smog. Watch a video below on the electrical nature of life to understand how dirty electricity and electro-smog can affect your life. From my professional experience, most homes have typical levels of dirty electricity 3-25 times over the limit ie between 100 to 800 mV, rising up to about 2500 mV from solar panel inverters. I find that the levels of DE are higher in towns, or densely populated areas and especially in high-rise blocks. The quality of electrical wiring can affect the levels of dirty electricity with old wiring making it more difficult to reduce dirty electricity. Plug in dirty electricity filters as close as possible to its source or it will flow backwards and forwards on the house wiring between the source device and the dirty electricity filters. If you have a lot of dirty electricity and DE filters don’t reduce it enough try to replace some devices with similar ones that produce less dirty electricity. For example, some low energy CFL lamps (compact fluorescent light bulbs) produce lots of DE and some relatively little. Usually, most LED lamps produce little DE and traditional, old-fashioned incandescent lamps produce virtually none. Some dimmer switches produce huge levels of DE and some relatively low levels. It’s possible that the quality of electrical wiring doesn’t allow to reduce the dirty electricity further, especially if it’s quite old. I sometimes find that no matter how many ED filters I’m plugging in the levels stayed the same. I also recommend this powerful mains conditioning filter which will greatly reduce radio-frequency noise and interference on your house mains electricity supply coming from your computers, TVs, videos, modern switched-mode mains adapters and chargers, etc. The filters are designed to dramatically reduce both “asymmetrical” as well as “symmetrical” interference. It uses high-frequency capacitors and an inductor/choke as well as an earth line choke to stop interference through the mains earth line. It uses a screened mains cable to eliminate the effects of radiated noise interference. What effect does dirty electricity have on health? A school in Minnesota where dirty electricity meters went completely off the scale had a cancer incidence in teachers nearly three times higher than average. There were also three former students who developed thyroid cancer in their 20s. (Milham & Morgan, 2008). 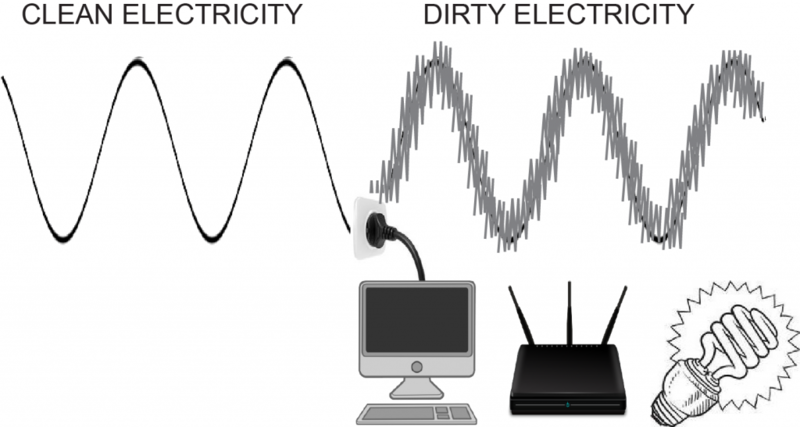 How can I remove dirty electricity from my home or office? Solution is very simple: install DE filters. Fortunately, the solution to removing dirty electricity is now very simple! Once the DE levels in your environment have been measured, the correct number of dirty electricity meters can then be installed to neutralise the effects in seconds. You should always try to find out what is causing the dirty electricity levels to be high – on your electrical wiring – to establish the best way to reduce it or remove it. The dirty electricity filters ideally, should be plugged in as close as possible to the source of the DE. For dirty electricity coming into your building from solar panels (big offenders of DE) or from the incoming electricity supply – plug in the DE filters as close as possible to the fuse box or electricity meter. Some countries take the health of their population much seriously. For example, the Republic of Kazakhstan. From the book called Light That Heals: Energy Medicine Today & Beyond by Donna Fisher: “The International Conference on Electromagnetic Fields and Human Health was held in the Republic of Kazakhstan in September 2003. In November of the same year, the state health department of the Republic of Kazakhstan issued sanitary norms addressing Transient EMF, a move which historically takes decades.” and “The Republic of Kazakhstan has acknowledged that there is no safe level of exposure to dirty electricity. A limit of 50 GS units (industrial) was immediately mandated to protect workers. For the public, in their homes and non-industrial workplaces, a reading less than 30 GS units is easier to achieve.” To find out more about The Republic of Kazakhstan, dirty electricity and electrosmog read the book Light That Heals: Energy Medicine Today & Beyond by Donna Fisher. You can purchase dirty electricity filters from http://www.emfields-solutions.com/filters/deoverview.asp but you may need to have a dirty electricity meter to measure the levels and how the filters are working. In this introduction to electrical nature of life, you can get a good overview of how electro-smog and dirty electricity fits into modern feng shui and the science behind it.